Jalousie windows are as prevalent as rubber slippers in Hawaii. Many older homes and condos have them. In the days before central air conditioning became common, jalousie windows were a common window upgrade for increased airflow (read: cooling). Think about sliding windows and when you open them, one side is closed because it's blocked by glass. Jalousie windows provide near 100% airflow when completely opened. 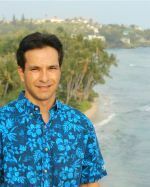 They are popular in Hawaii and other warm climates and less so in cold climates because even when completely closed, air can still pass through. Not desirable on a cold evening when the heater is on. In Hawaii, most homes and condos don't have heaters. 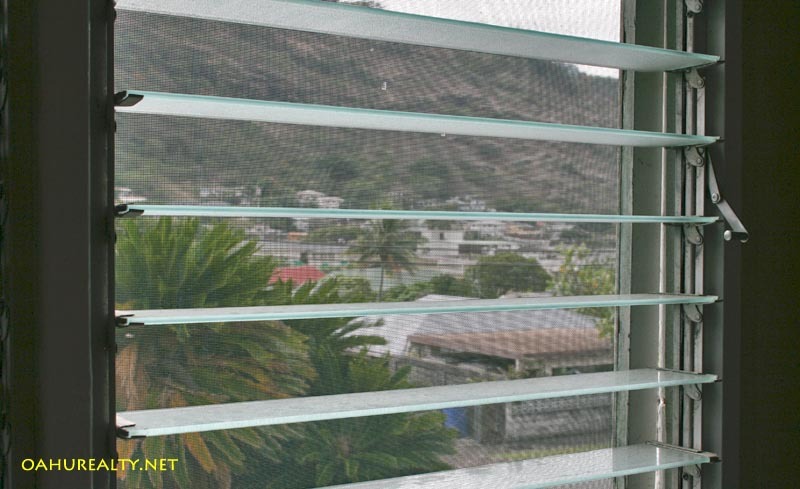 Jalousie window panes are held in place by aluminum frames and mechanisms. They hold up reasonably well if they are periodically maintained. "Maintenance" involves oiling the moving parts and many people overlook maintaining them. Another maintenance consideration - when the mechanisms quit moving smoothly, the jalousie glass might get twisted when the window is being opened or closed. Glass doesn't hold up well to twisting and it may crack or break. Then the owner has an extra assignment, fix the mechanism and replace the cracked or broken glass. 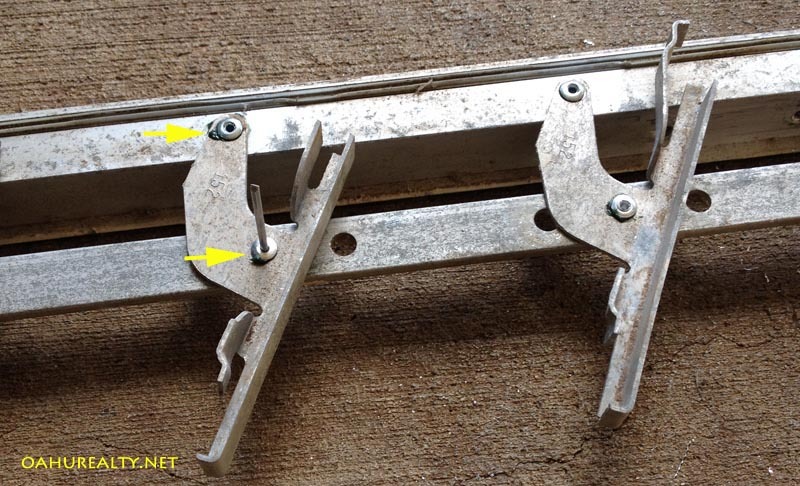 When a window frame fails the moving parts usually have corroded due to lack of lubrication and then they break. Let's see how we can fix those broken parts! Drill and assorted drill bits. Needle nose pliers - not a necessity but they can come in handy. In this case we removed the jalousie window frame from the window. It's not always necessary to remove the frame however it's easier to work on the frame when it's removed and sitting on a workbench or on your floor. Here's the frame of a jalousie window frame with a broken post. The post supports the the part that holds the jalousie glass. We'll drill out the post. 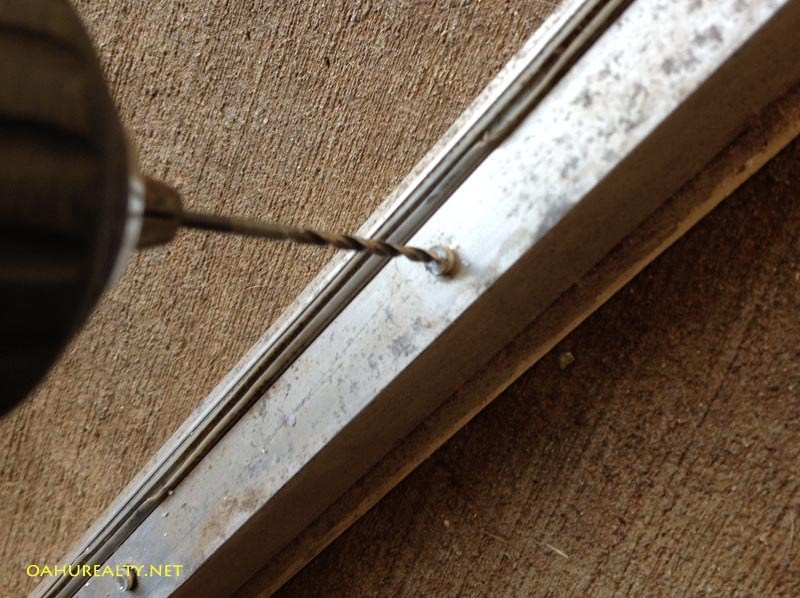 It's good to use a small drill bit to make a pilot hole and then use a larger drill bit to remove the entire post. 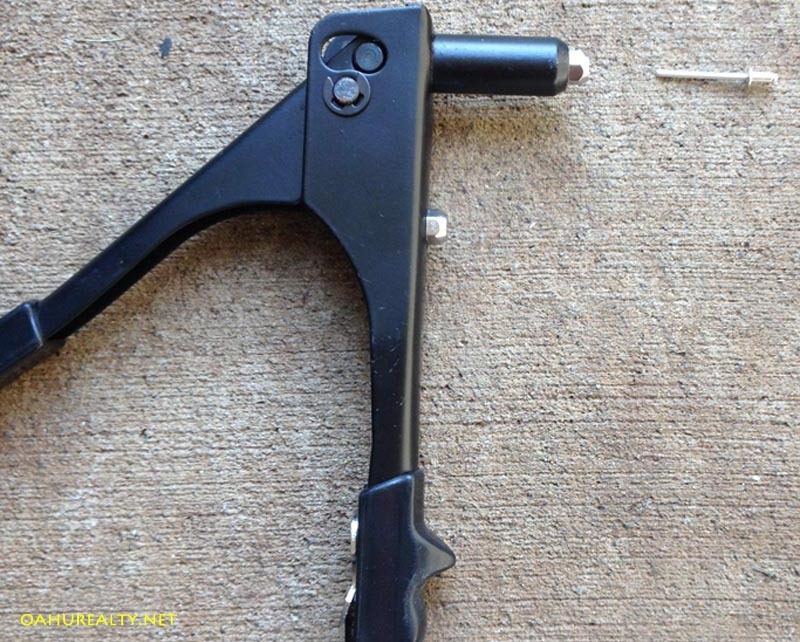 This is a rivet gun. When I bought this gun, it had no instructions. Rivet guns aren't very complicated though one might think a set of basic instructions would be included. 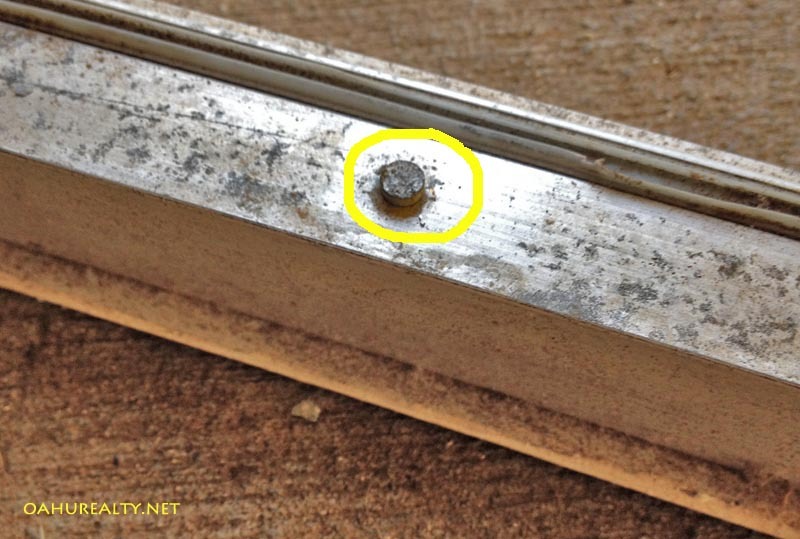 The little metal part that kind of looks like a nail is a rivet. Rivets come in different diameters and lengths. I find that 4mm diameter medium sized rivets work well. You can choose aluminum or stainless steel rivets. I like to use stainless steel because it's stronger and it won't rust or corrode. 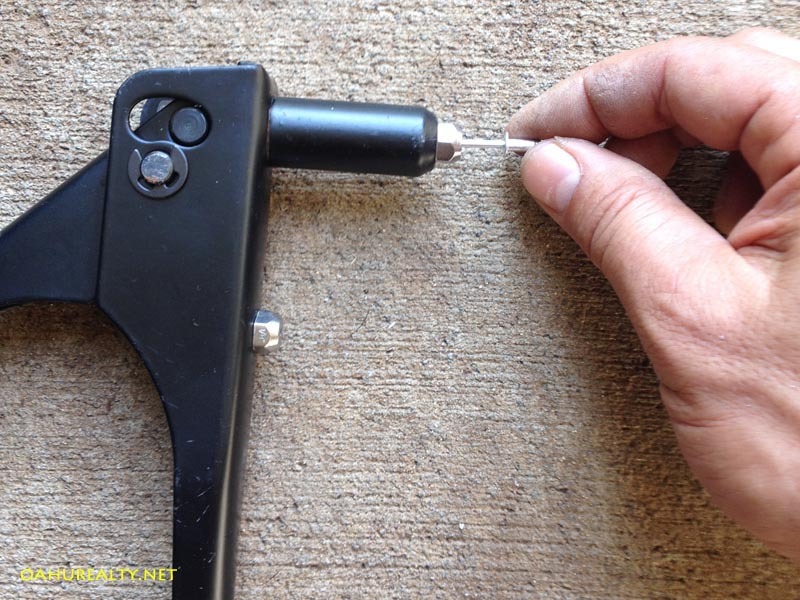 This is how to insert a rivet into the rivet gun. It goes all the way in so the shoulder of the rivet is seated on the gun. Here's the rivet gun with the rivet inserted and ready for installation. The rivet gun in action. 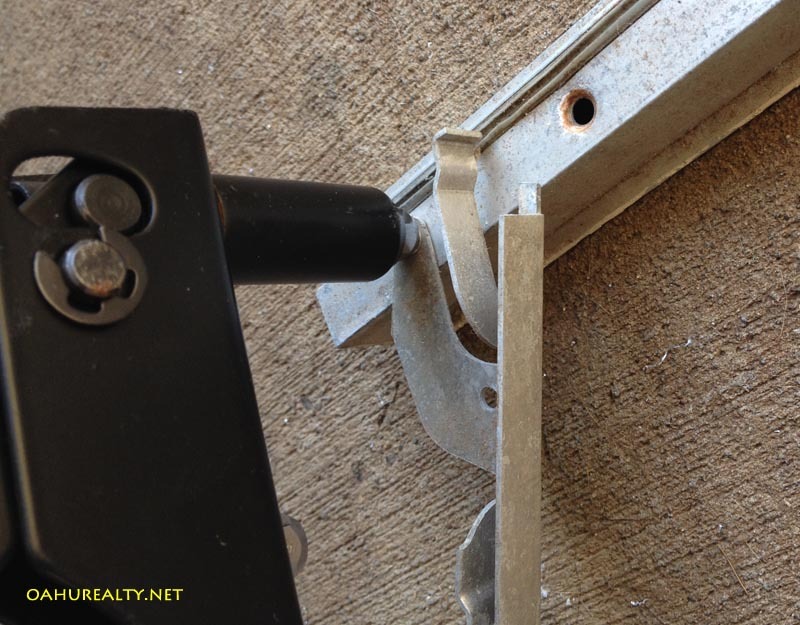 We're riveting the window pane holder back onto the frame. 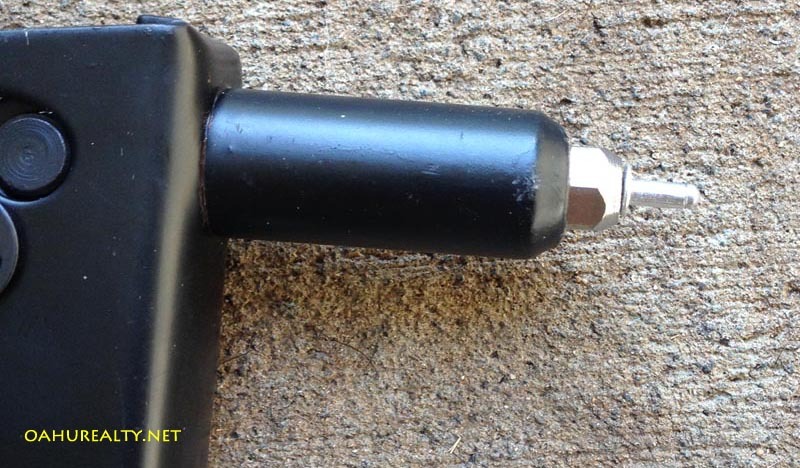 Pull the rivet gun handle a few times and it will install the rivet. Leftover metal from the rivet will fall out of the gun and it be discarded. There's an arm that runs parallel with the mechanism. The arm controls the window pane holders and moves them in unison to open or close the window. After all the parts are riveted and pivoting freely, make sure and use a lubricant to oil the joints. Sewing machine oil or bicycle chain lube works well. The arrows below show the points to lubricate. The holes in the center of the rivets are blind holes and it's useless to put lubricant in them. The lubricant (in this case automotive grease) should go around the rivet so that it gets to the areas where the parts are moving against one another. Here's a window with jalousie glass installed and with mechanisms working properly. It's clear that airflow is near perfect throughout the window when the jalousies are opened. And that works great on hot days. If you have any questions about jalousie window repairs post a comment and I'll reply promptly!